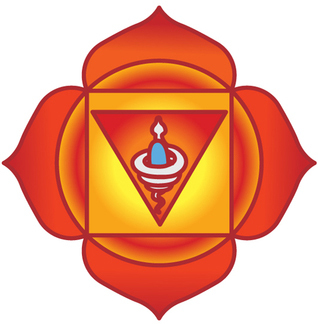 The root chakra is located at the base of the spine. The color associated with this chakra is red, and it reflects our connection to earth. This chakra is very important in terms of balance. Someone who is very spiritual may experience patterns of sadness, hair loss, back pain, or depression if the root chakra is closed or weak. The root chakra is associated with our sense of security, financial stability, and grounding. When the root chakra is in balance one can notice a huge improvement in physical health, and physical energy levels. For a complete balance one should balance earth energy with source energy (cosmic energy), this is also called the balance of Yin and Yang; The root chakra is the gate to earth energy while the crown chakra is the gate to source energy. sit comfortably, and make sure not to be disturbed for at least ten minutes, make sure your bare feet are rested firmly on the ground. Start breathing slowly, and deeply. Feel your body parts relax as you breathe, let your feet relax, let your legs, your hips, and torso relax. Let this wave of relaxation move up your spinal cord relaxing all muscle groups in your back, feel the relaxation wave move your abdomen area, and then slowly going up your chest relaxing all muscles, and organs in that area. Allow the wave of relaxation to slowly move to your shoulders, neck, and head, then feel it on your face, let it relax all muscles on your face, feel this wave of relaxation taking over your whole body until you are completely relaxed. Now that you are relaxed, imagine, and feel a red ball of energy spinning at the base of your spine, notice the spinning speed, slow it down or speed it up as required. Then imagine a stream of white light going down from the sky, entering your crown chakra and going all the way down to the red spinning ball of energy, feel the light purifying and balancing your root center. Continue to feel your root chakra balancing until you think its enough, then imagine, and feel the white light leaving your root center through your legs, then through your feet to the ground, let it go deep into the ground. Thank source for the healing light, and end your meditation. The guided meditation below helped me awaken my root chakra, in case you don't like, you should be able to find more good alternatives on Youtube. I spoke earlier of physical activity, and sports where physical effort is required; This is one way of how you can practice grounding; but also, you can walk barefoot whenever possible, near the beach, on the grass; Try to enjoy how the earth feels beneath your feet. Another common way for grounding is to sit and lay your back against a huge tree, take a shower, or eat a nice protein meal. Essential oils like cedarwood, Patchouli, and myrrh are great tools to help balance, and purify the root chakra, you can use them during meditation or just in the room where you are present. For more information on how to use essential oils please check how to use essential oils effectively. minerals, root veggies like carrots, potatoes, parsnips, radishes, beets, onions, garlic, etc, and rich protein food can all help balance the root chakra.